Come and visit one of Australia’s most exciting and unique fresh water fisheries. Situated an hour and a half NE of Perth, Western Australia, Nick Hocking’s new world-class catch and release fishery is now open and chock full of potential Australian record sized Silver Perch that are just waiting to test your angling skills. Monstrous silver perch swimming around in pristine, crystal clear waters as shallow as 50cm, makes for not only one of the most unique angling opportunities in the country but also one of the most exciting by far. Witness these iconic Aussie natives as they cruise around their pristine environment taunting you to catch them. If you are looking to really test your angling skills than this is the location to do it, hard body spin, soft plastic spin, surface and fiy options are all available here. Click HERE to Watch Videos about The HUGE Silver Perch of Lake Bidyanus. Simply relax and cast as our highly experienced fishing expert guides you around our uniquely pristine environment maximising your time on the water. The current Australian silver perch record is 4.23kg set in Windemere dam NSW. 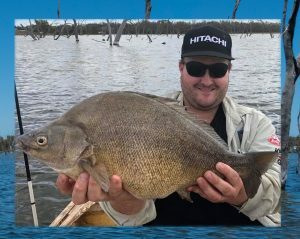 There are silver perch in Lake Bidyanus that well exceed this record weight and it is only a matter of time before some lucky angler catches one. It might as well be you! Our fish are not pellet fed and have grown in a wild and pristinely natural environment for many years conditioning them to feed on the natural prey items existing throughout their local ecosystem. This provides our angling clients with some very large and very hungry fish that aggressively attack any artificial lure or fly thrown their way making for some very exciting fishing indeed. Nick even has an exclusive A class club fishery designed to test even the most competent and skilful anglers. “I booked a private guided session with Nick Hocking and the chosen location was what can only be described as a world class fresh water fishery. “Having been told about the potential of this lake to produce a record fish, I came prepared to claim an Australian All Tackle Record for Silver Perch if the fishing gods would allow. “I would have been happy with a few 30cm specimens in the two hours I had, but I was blown away!! With Nick’s eagle eye and expert guidance, I not only caught multiple fish, including one just short of an Australian All Tackle Record (and it would have been a 4kg line class record).